As a performer, I’m gratified when members of the audience come up to talk to me. Likewise, I never hesitate to introduce myself and talk to musicians whose performances I enjoy. In the latest case, I sent a Facebook text message to the Finnish ukulele band to welcome them to London and express my intention to see their show, before I had even met or heard them. On my first visit to the Ukulele Wednesday get-together in June, I saw official-looking black and white postcards scattered on the tables in the Royal George Pub in Soho. What is Ukevox? I was curious and bookmarked it in my diary. 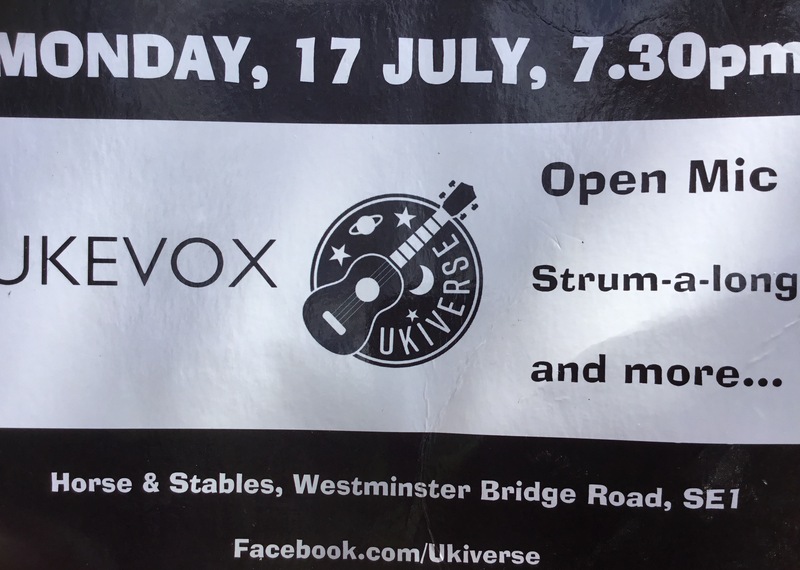 From the Facebook ukulele group pages, I learned that Ukevox was also performing on Wednesday 19 July. It always amazes me how many people could fit into that basement room of the Royal George. Once a month, the party starts an hour early for open mic. On other Wednesdays, the jams start at 8 pm. If you don’t get there before 8 pm, chances are you’d have to wait until 9:30 pm before you’d find a space to sit or stand. It’s free to attend but it’s customary to grab a drink at the bar before heading downstairs. 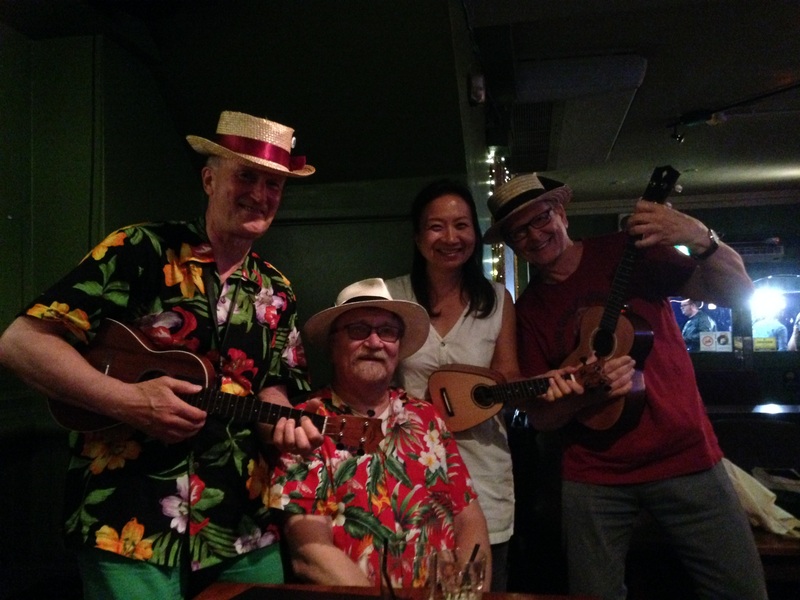 On this occasion, I brought my friend David, a classical guitarist, to see UkeVox, and experience his first ukulele jam. At 7:15 pm, we were lucky to find two high stools in the back of the already full basement. From there, I observed the exasperated and often confused expressions of individuals who arrived later, their struggle to find a seat or squeeze between others who were comfortably situated with their cold drinks and precious ukuleles. Some looked as though they were cheated of their usual spot because of unfamiliar faces that claimed their space. It was also impossible not to smile and chuckle when the band performed. How do I put it? It was authentic and not commercial. They seemed passionate and dedicated to what they were doing. I’ve never heard Finnish folks songs or seen a Finnish ukulele band before. Their choice of repertoire, vocal harmonization, melodic and improvisatory riffs on the lead ukulele, and friendly but funny introductory remarks by the band leader not only put the audience at ease but also made us feel inclusive. They looked like they were having fun. Their version of Glendora, a song I’ve never heard before, was hilarious. After an encore, they stepped off the stage shortly after 8 pm to allow the usual ukulele jam session to commence. After a short break, the band members returned and jammed with us, through Folsom Prison Blues and other favorites. I kept hoping people would leave and clear a small aisle for me to get through the crowd and introduce myself to the band. Wedged in the very back corner of the pub, I could not see myself getting to the stage without knocking over drinks. I acquiesced. Thank goodness for that! I spent the next hour (until we were kicked out of the pub) getting to know the three members who hadn’t yet returned to their hotel in Hyde Park. They had formed their band from their ukulele club last autumn so that they could go to the ukulele festival in Liverpool. There they met Ukiverse who invited them to London. This was a promotional trip, they said. All members worked full-time but hoped that they would be able to tour more after retirement. They invited me to the world’s northern-most ukulele festival: Finland in January 2018, when there’s only five hours of daylight.